When you find yourself locked out or that your keys have been lost or stolen, it suddenly becomes apparent as to why it’s important to keep a spare key in an out-of-the-way spot where only you will be able to access it when needed. Following are the reasons why you need a spare key for your car and home and how to hide them. Hide a spare key in a spot that is not obvious. You’ve probably heard of people who tuck a spare house key under the welcome mat or in a magnetic compartment within reach on their vehicle. While hiding the spare is a great idea, it’s very important that you take care in where or how you choose to hide them. You don’t want a crook to lift your welcome mat and enter your home. Tucked In Your Vinyl Siding of Your Home – Tie your key to a string of fishing line, and find a specific spot in your vinyl that is unsuspecting to passers by. When it comes time to use the spare key, simply go to the spot and pull the fishing line to recover the key. Bury the key – Find a spot in your yard, preferably not near the front door, where you can buy your key. To make sure the key does not rust and that you can retrieve it when needed, first place it inside a plastic medicine bottle. Under The Deck out of sight or inside a dryer vent or meter box are a couple of clever spots as well. Inside a Birdhouse – Tucked under your welcome mat is a welcome invitation for a thief, but who would suspect the bird’s house contains a key to your front door. Underneath the Dog House or On Dog’s Collar – If a burglar has to potentially disturb a dog to find your key, it is definitely a deterrent. So, hiding your key under the dog house is a good idea. An even safer place it to discreetly and securely attach it directly to your dog’s collar. Out of Sight On Your Car – If you store your car key inside a magnetic box under the bumper, make sure it is tucked away in an unsuspecting spot or in a box that requires a combination or key to open. If the key is a traditional metal cut key, you can unscrew one of your license plate screws and slip the key onto the bolt behind the license plate. Keyless Entry Locks – If you are prone to losing your keys, an electronic keyless entry system may be your best idea. These systems do away with the need for a key all together. When you cannot find your keys, or your keys are locked inside, you will be glad that you have tucked away a spare key. Our professionals at Glendale Locksmith 24 are ready to come to your location when you lose your car or home key and wish you had taken the time to hide a spare. How is a double-sided deadbolt different from a single-sided deadbolt lock? A double sided deadbolt, sometimes called a double cylinder deadbolt lock, requires a key to open both sides of the lock whereas the common single-sided deadbolt that is used in homes usually requires a key to open the outside while the inside has a knob to turn for locking or unlocking. The answer is simple, but the results of the lock you choose could mean the difference between keeping your family, home, or office safe or endangering them. The biggest benefit to the double sided deadbolt is that it is designed to provide a higher level of security by making it more difficult for an intruder to unlock or pick the lock. Double sided deadbolts are considered to be one of the safest lock choices for your home. While the common, single-sided deadbolt provides security, if there is a window within arm’s reach of the door, a burglar could break the window and easily reach in and turn the knob on the inside of the deadbolt to gain entry. The double sided deadbolt, on the other hand, would require a key to open on both the inside and the outside of the door, so even if a would-be crook broke the small window next to the door, he or she would not be able to turn the lock open. Another benefit of a double sided deadbolt is keeping those inside safe. Just as important as keeping would-be robbers out is keeping those you love who need extra protection inside. If you have small children or an adult with dementia, a double sided deadbolt that requires a key to open it regardless as to whether you are on the outside or in, safely secures those you love and care about inside the building. Of course, you must also secure or limit access to the key. 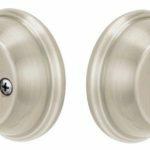 The biggest con of a deadbolt that requires a key to open whether you are on the inside or the outside of the door is that the very things that make it difficult for intruders to break into your property are the very things that also make it more difficult for those inside to get out in case of an emergency. In a fire, for instance, you would have to first locate the key to the double sided deadbolt in order to exit the danger in the building. An emergency exit door must be easily opened without using any keys. A double sided deadbolt should never be installed on an emergency exit door. Even if the door is not currently considered to be an emergency exit only door, once a double sided deadbolt is installed on the door, you will not be able to use it as an emergency exit. Making a decision as to which lock is the better choice to secure your home or office is important. The safety of your family or commercial property is at stake. When you need to make a decision about whether a single-sided or double sided deadbolt is best for you, first talk to a professional locksmith who knows locks well and will be able to recommend which lock is best for your needs. Today, you never know when a bad thing could happen. For this reason, you want to make sure the protection of your family is one of your first priorities. Of course, you can make this happen by using things like reinforced doors. However, they are of little use if you do not have good locks on them. 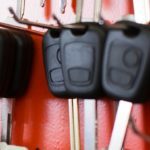 In considering this, you should make sure that you find a reputable locksmith in Glendale, Arizona and here is some information that can help you with your search. While you are looking for a locksmith, try to find someone who is the best at what they do. When you have this in mind, look for a reputable company, which will improve the chances of having someone ready during the times you need them the most. Ultimately, a trustworthy Reliable Locksmith Glendale AZ, is one of the most significant things. The last thing a lot of people want is someone who will waste their time or money. Also, hiring someone who is deceptive can put your family and possessions at risk. Essentially, you should look for a local company. The steps below will help you find a locksmith in Glendale, Arizona that you can trust. The first step to find a reputable locksmith company is research. When you are searching for information about the company, also ask around. In most cases, someone will know about a locksmith they recommend or think you should avoid. Besides, the internet acts as the source for finding customer reviews about the company. While you are researching the Reliable Locksmith Glendale AZ company, search for information about whether people recommend the company, as well as the time they have been around. Additionally, check whether people were happy with their past work. Most of the companies around today have some kind of presence online. Therefore, you should take advantage of this to find out whether the company has any kind of references among other things. Also, if the company has a website, it ‘d be good to take a look at this as well. While you are looking at their website, look at things such like the company’s philosophy. Check if they are a company who has the types of services you are seeking for. One thing to note is whether their website looks as if it is reputable. Also, you should see whether they are a company that will have the ability to unlock whatever it is you need within a little period. The next step after finding a potential company involves the process of calling and asking them questions. This way you get a better feel of the type of customer service they offer. Also, ask them about their prices, as well as the types of payments they accept. You should ask whether they have any type of extra charges in some situations. Finally, another way you can ascertain if the locksmith you have chosen is a reputable and legitimate one depends on what they do after they complete the job. A reliable locksmith company will hand over all sets of keys and do not set the system up to allow a master key, and they should inform you of all the necessary information that would be kept on file in regards to your account and the reason why. In general, finding a good locksmith in Glendale, Arizona, is one of the most significant things that you can do for the protection of your family. In any case, always make sure that you investigate the company before allowing them to come to your home. Spending the time searching for the perfect reputable Reliable Locksmith Glendale AZ and ensuring they meet all of the criteria listed, can save you hours of anger, frustration, and money in the long run. When it comes to protecting your loved ones and keeping your belongings safe, it is always worth the effort. Ensure that you don’t fall victim to scam. There is only one locksmith in Glendale, Arizona that you can rely on; Glendale Locksmith 24. Glendale Locksmith 24 provides a professional 24-hour Locksmith service across Glendale, Arizona. You need to use Reliable Locksmith Glendale AZ for a lot of reasons in an emergency or non-emergency situations. Whatever your reasons may be, you want to be completely assured and confident you are using a company who is Credible, Trustworthy and Fairly Priced. Glendale Locksmith 24 will offer just that! We aim to reach you within half an hour for emergency situations and within two hours for the equally as important non-emergency situations. To know more about Glendale Locksmith 24, click here. High security locks provide increased protection against attacks. Common, inexpensive locks can easily be thwarted by experienced criminals with a minimal background in lock picking. If you use child seats in the car to protect your children, safes to protect your valuables, and insurance to protect your vehicle, why wouldn’t you invest in high security locks to keep your house protected against break-ins and theft? Thwarts attackers by making it much harder to insert and manipulate tools within the lock. Restricts key duplication by controlling the creation and distribution of key copies, which greatly increases security. Many keys also required a security card to be presented to a locksmith to duplicate keys as well as a specialized machine to cut the keys. Key differs is a term to describe the number of different keys that could open a lock. High security locks often have safer key differs that prevent cross keying and allow for complex master keys, which aid in resisting lockpicking and other covert methods of opening locks. Increases resistance against lockpicking and decoding attacks. Examples of manipulation resistance characteristics in high security locks include security pins in pin-tumbler locks or components designed to oppose impressioning or key bumping. Steel rods, ball bearings, and hardened materials are used to resist physical destruction of the lock. Helps promote longevity of the lock. Mul-T-Lock is a global company offering high security locks as well as smart locks and more. Medeco has been offering high quality, high security locks for the last 50 years and they have become a dependable favorite. Yale has millions of locks in use worldwide. They are a tried and true option with high security locks that in the top of the competition. Do Need To Improve You Security? We Are Here To Help! Feel free to call us 24/7, Our locks specialists we’ll be happy to serve you!